I remember my last flight. It was the afternoon’s end, and just a few minutes after we took off, the ground control called us to inform that we have just 20 minutes until sunset. In fact, the runway was almost invisible, and the little Amarais airport was not equipped for night operation. We touched the ground at the same time the sun began to hide behind the hills. That was a very short flight. It happened almost twenty years ago, and I never had another opportunity to take the flight controls, but I’m missing that feeling. I can remember also my first flight. 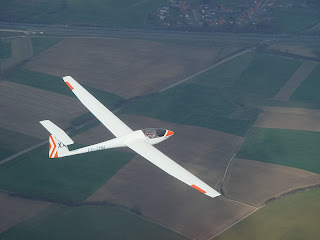 I was a memorable experience, because I took my first flight in a sailplane. It was a kind of airshow in a crowd small airport. The flight instructor helped me to go inside the tight cockpit and fast the seatbelts, while I checked the flight controls. A long hawser connected my little long-wing aircraft to another airplane with a powerful and noisy engine. So my flight instructor took the rear seat, while two other people helped to hold the glider’s wings. Suddenly, the powerful plane starts moving, dragging us through the runway. After running a few meters, we were flying, a turbulent flight due to the plane’s propeller. There are no thermals that day, so it was also a short flight. But it was a wonderful flight. We climbed until 3000 feet when I released the hawser while turned to the left and the plane to the right, in order to avoid an air collision. Suddenly, our flight became silent and smooth. The only noise we could hear was the wind blowing on canopy. I’ve learned to fly very quickly. I had other flights after that, but no one was like my first flight. -Engine failure. That do you do now? -I need to look for a landing place. - I answered. -Like what? - He asked. -Maybe a meadow – I replied. -What do you think about that runway over there – He said while point to the landing field. I was very embarrassed for not seeing the runway, but I learned how to recognize a runway from the sky. It’s impossible to forget my stall training. I don’t like stalls, because it is like a roller coaster, and I hate roller coasters. However, a pilot must know how to recover from a stall or a spin. So my instructor instructed me to climb to 5000 feet, over a large lake. When we reached the 5000 feet, he told me: “Now we’re going to practice stalls”. He executed 3 consecutives stalls, one half right spin, one half left spin and said “now is your time!” My stomach was not so good at that time, but I did my job. It was not pleasant, but I know that training was important. There are only few months between my first and my last flight. Only 13 hours is the time that I could pay for, in an expensive country where our dreams never come true. I still dream of flying, and all that I want is that my dream come true. James Lovelock, a British scientist, is the author of the Gaia Theory. 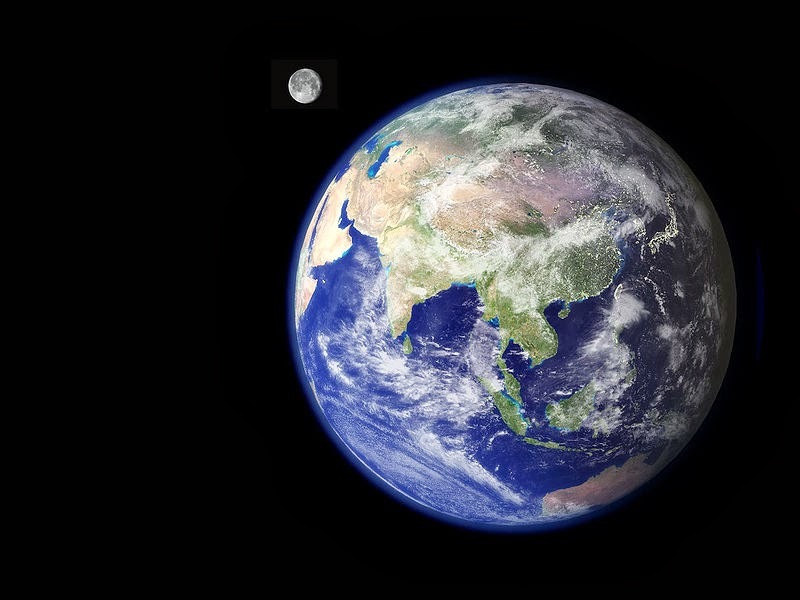 For those unaware, this theory states that the Earth has the ability to auto regulation of its environmental conditions, including temperature and chemical composition, in much resembling a living being. According Lovelock, the earth behaves as a living being, except for the ability to reproduce. 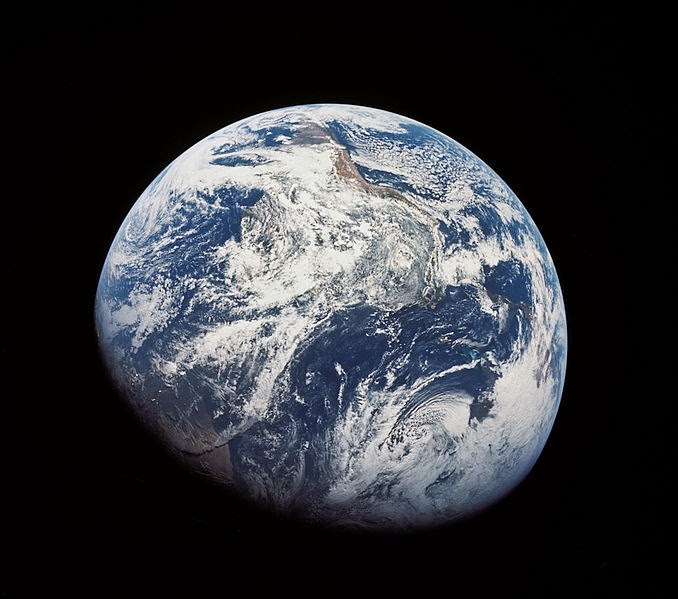 This theory caused much controversy in the 70’s and 80’s of the twentieth century, when this theory was known only as the Gaia Hypothesis, whose name was inspired by the Greek goddess representing the Earth. This personalization of Gaia earned much criticism from the scientific community against Lovelock, while it made ​​the hypothesis gain support among environmental and esoteric groups. Thanks to various scientific evidence and support from many scientists, especially climatologists and glaciologists, the Gaia Hypothesis eventually won the status of a theory, being formally accepted by the scientific community. The Gaia Hypothesis predictions guide the actions of the IPCC, the United Nation's advisory body on climate change. In one of his latest works, the book "The Revenge of Gaia", Lovelock discusses how human influence disturbed the delicate balance of Gaia, being the most notorious example of this disorder the current climate change. According to Lovelock, we have gone too far this disturbance and we are about to cause an irreversible environmental change, which Gaia will not be able to cope alone. According to him, sustainable development is unable to reverse the situation, and only a "sustainable retreat" would be able to minimize the effects of this environmental change. Furthermore, only proactive actions could reverse the damage already done. But what does he means by "sustainable retreat"? We live today in a context in which development is directly linked to consumption. We consume food, clothing, hygiene and cleaning products, appliances, computers, phones, cars, etc. The more a nation consumes more is considered developed. Now consumption implies production of new items and disposal of used ones. Some goods we consume are considered durable. For example, we buy houses to last at least 30 or 40 years. Others goods are not so much durable. We buy cars to last 10 years, TVs to last 5 years, and cell phones to last six months. Not to mention the waste we generate and the emissions of various pollutants. The large cities are becoming increasingly unhealthy thanks to sulfur dioxide and carbon monoxide emissions, soot, etc. Most people consider carbon dioxide as the worst villain, due to its influence on called greenhouse effect, which is the ability of the atmosphere to retain solar heat. Excess carbon dioxide is supposedly increasing this effect and warming the planet. But this is only one of many aspects of climate change. We change the climate when we deforested woods for agriculture, livestock, mining, hydroelectricity, etc. We change the climate when we release pollutant materials into rivers and seas, changing its chemistry and upsetting the ecological balance. We change the climate when we burn our garbage or when we launched it into environment. We change the climate when we replace native forests by a pine or eucalyptus monoculture, which are darker and absorb more solar energy, heating the environment. We change the climate when we throw away our old car to buy a new one, because to build a new one, we need to extract more iron from the soil, forge more steel, distillate more oil, purify more aluminum and other activities that negatively impact the environmentally. Some people may have the idea that, to not impact on the environment, we should live like the old days, when people extracted themselves the nourishment from the soil, made their own clothes and utensils, and lighted the night using oil lamps. But this is not possible anymore. Nowadays we are over 7 billion people. It is no longer possible to maintain such population without mechanized agriculture and industrialized production. If we abandon the cities and turn to the country, there would not be room enough for everyone to plant food, especially without using modern methods. If we would be forced by decree to abandon at once all technological resources that we have, chaos and barbarism would be established shortly. Millions would die without food and millions of other by diseases or wars that inevitably would happen as a result of disputes by the few resources available. Therefore, we cannot abandon science and technology. What we need is a way to better utilize the resources that we have. In order to give Gaia an opportunity to self-recovery, we need to reduce to almost zero the resources that we extract from the planet. It means that we should have to deal with the resources that we already extracted, with no more extraction. This is what constitutes sustainable retreat. Therefore, we need to radically change our consumption structure. We should manufacture cars to last at least 50 years, TVs sets to last 20 and phones to last 10. We should recycle 100% of our garbage, and our energy consumption should be minimal. We should have to improve energy efficiency for cars, appliances, industries, etc. Maybe we should ration food. However, we can avoid it by reducing losses in transportation and storage. 1. Collection of strategic information - Perhaps the biggest challenge faced by governments (or at least by serious ones) is reliable information based decision making. Historically, all governments have been engaged in collecting information about population and economy. Nowadays, a new type of information has become necessary: information about environmental resources and human activity’s impact over these resources. Science and technology information are also necessary to make strategic decisions. More than ever, we need to refine the information’s quality available to governments and public policy makers. More than ever, it is essential to distinguish the wheat from the chaff. 2. Energy and materials efficiency - Most of the resources available to a nation are finite and non-renewable. Water resources, mineral reserves, native forests and agricultural lands are examples of these features. It is essential to optimize the use of these resources. The fight against waste must be the focus. A good example is how vehicles use energy. A conventional combustion vehicle waste about 85% of the energy produced by burning fuel through tailpipe. In a context of sustainable retreat, the adoption of electric vehicles is not simply an interesting option, is mandatory. The same is valid about the adoption of thermal insulation building materials in order to minimize the energy spent by air conditioning in the summer or heaters in the winter. Selective waste collection is not an option, is mandatory. Recycling should not simply be a good deal, but the basis of a new economy. 3. Extinction of war - In our current situation, any war is completely nonsense. Iraq and Afghanistan wars have been cited as the main causes of world economic crisis. A possible World War III would totally ruin our economy and our civilization, even if nuclear weapons would not be used. In an environment-preserving context, any kind of war would not make any sense. 4. Extensive, general and unrestricted education. - Nothing that was mentioned above is possible without universal, good quality, free and accessible education. This is something that simply cannot be underestimated. Teachers should be the best-qualified and best-paid professionals. Schools should be the best equipped, valued, and admired institutions. Teaching should be a good and enjoyable experience, so that student’s absences should be rare. Companies should provide all kinds of educational incentives, including reduction of the working day in order to provide time for workers to study. Some people may think that all this is nothing but a utopia. But only this utopia can save world in which we live. I like the concept of Gaia, the Living Earth. I especially love it because it offers a way to see our world as a living being without appeal to any mystical explanation. I like because it shows our world as it really is: alive and fragile, susceptible to poisons but with defense mechanisms. Gaia has its "immune system" and will do everything possible to stay healthy. One of its many defense mechanisms is temperature control. This system is complex, but fascinating. One of the tools for this control is the polar and mountain glacier. Water is a fascinating substance. One of its many properties is its high thermal capacity. The water can contain five times more heat than aluminum, 10 times longer than steel, and twice the capacity of the ice. Furthermore, while 4180 Joules are required to increase in 1ºC (2ºF) an amount of 1 kg water (more than 2 pounds), 334,000 Joules are necessary to melt the same amount of ice at 0°C (32ºF). Therefore melting ice is difficult. If properly packaged, the ice may not melt for many years. Therefore, a large amount of energy can be absorbed by ice. Additionally, the ice’s clear surface reflects back to space most of the energy coming from the Sun Polar caps are our air-conditioning system. One of the arguments used by critics of global warming is precisely the fact that, in recent years, the climate apparently shows a tendency to revert the trend of warming, showing severe winters both in the north and south hemisphere. Interestingly, during this time of stringent winters, the glaciers’ melting rate showed above average speed. This is no coincidence. In fact, this melting is a part of Earth’s temperature control mechanism, because each kilogram of melted ice removes from the environment a lot of energy. However, this is no reason for us to be carefree. The control mechanism is working, but is being pushed to the limit. This is because as the ice melts, there is a darkening of the surface of the earth with a consequent increase in absorption of solar heat, which melts the new masses of ice. Our body has also a temperature control mechanisms. When our body is too hot, it starts the sweating process. Some water in our body is released through the skin pores. Water’s evaporation cools our skin. This occurs because the energy required to evaporate the water is greater than that necessary to melt the ice (2,260,000 Joules per Kg) Body heat is used to evaporate the water, making it colder in the process. In some situations, this control can fail. If a person stay for long periods under hot sun, the perspiration’s water evaporates at a much higher rate, due to sun’s heat. Virtually no body heat will be used in the process and the person will eventually become strongly dehydrated. This process is known as sunstroke. One of the symptoms of heat stroke is high fever. As a defense mechanism against stroke, people adopt defensive behaviors, such as drinking plenty of water and seek a shady spot. One consequence of heatstroke is burns skin, which among other disorders, triggers an inflammatory process and impairs the ability of the skin to perspire, worsening the symptoms. Similarly, the Earth is suffering heatstroke. But unlike a careless sunbather who abuses the sun, the Earth is in this situation because we have interfered in their defense mechanisms. The vegetation cover, glaciers and marine biomes are like the skin with important participation in the planet’s temperature control. Maybe the Earth could support a large amount of CO2 in the atmosphere is its vegetation and the oceans were intact. Since they are not, this burden accumulated over the glaciers. This is the part of global warming which is usually not mentioned. There is a commitment in the media to show that the CO2 from burning fossil fuels is solely responsible for global warming. It gives to the public the idea that global warming is the main, if not the only one environmental problem we face. In fact, global warming is just a fever. The disease is much more severe, it can potentially kill the patient. Sad to say this, but the disease is we, humans, since we have extracted from the earth three times more resources than it would be able to replace at its maximum capacity. We have behaved as grasshoppers in planting, eating up to the last green stalk. In an attempt to minimize the effects of our lifestyle, much has been said about sustainable development. Unfortunately sustainable development has been represented as a mere action for compensation. Many products currently present on their labels messages like "This product has offset its carbon emissions by planting trees," or "This product is environmentally sustainable." These actions, if real, are usually mere palliatives. Most of the time, companies have not taken any concrete action. They just bought some carbon credits and continued to do things as they always did. A few companies have adopted real sustainable practices like fighting waste, energy efficiency and true support to environmental programs, such as Brazilian’s SOS Atlantic Forest Institute. Surprisingly, these companies realized that sustainable action reduces costs and increases profits. Here I quote from the British scientist James Lovelock’s book "The Revenge of Gaia" (Basic Books, 2007). I have read a lot about climate change, but only Lovelock seems to have a structural view of the problem, a physiological view in fact. Lovelock speaks convincingly about the Gaia theory, how the Earth can maintain homeostasis, i.e. maintaining a highly dynamic and theoretically unstable environment in equilibrium. Showing a great knowledge in the area, although he admits that this is an area that we are only beginning to understand, he makes it clear the ways we are interfering. Also he shows the extent of the damage. This damage is so great that, according to Lovelock’s opinion, it is not sufficient a sustainable economy, but a sustainable retreat, in parallel to an army in retreat when there is no way to win the battle. Although fatalistic (and sometimes only fatalistic discourse takes effect), his point of view has been continually corroborated by numerous scientific studies. But how can we conciliate a “sustainable retreat” to the needs of poorer countries growing? We live in an unfair situation in which 10% of the population consumes 90% of the resources. The remaining population lives in situations ranging from just above the poverty line to the extreme scarcity. Piped water and sewage are luxuries that many do not even know exist, and medical care is just unthinkable. These populations often derive their living from the land without proper techniques, which simultaneously degrades the soil and produces an insufficient livelihood. I’d like to talk about a personal experience about efficiency. A few years ago, I was a fire safety equipment designer. It was a very competitive market, but all manufacturers offered very similar solutions. At this time, fire alarm equipments consumed several tens of Watts. Nobody seemed to care much about it at the time because this consumption was equivalent to one or two light bulbs. But it bothered me, because the equipment needed large and heavy power supplies and batteries to operate even in case of power outages. The devices were big, heavy and warm a lot. With a little research, I discovered electronic components that allow designing smaller, more efficient, less consumption, and more reliable devices. But they simply were not used, because the prevailing paradigm about heavy and energy-wasting equipment. My first project using these new components was still big, but consumption was reduced to one tenth of the market standard. It was destined to Brazilian INPE's headquarters in Cachoeira Paulista. I believe that this equipment is still operational today. Subsequent equipment’s generations of have become more compact, reliable and energy efficient. If I were still working in the area, I know that nowadays I could obtain even better results. I mention this story to show that our technological development led us to the point where we can be more energy efficient, highly efficient. Much of the resources that we extract from the earth are to produce energy. Energy used for transportation, lighting, heating, cooling, and to manufacture most products we use. Energy is a precious resource. Without energy, surely we would not exist. Without abundant sources of energy, we could never reach 7 billion people population. All goods and resources that we need rely directly or indirectly from our energy sources. Maybe we don’t have to think about sustainable withdrawal as dramatically portrayed by Lovelock. It may be possible to greatly reduce our environmental footprint by changing the way we use energy and materials, and using the best technology we have available. We can do thing like increasing energy efficiency, improving industrial processes, eliminating waste in manufacturing, storing, transporting, distributing and using goods, increasing consumer goods lifetime, using better and not polluting water sources, improving construction techniques, using land and urban space more rationally, recycling 100% of waste produced and stop producing items that can not be recycled. We can also have good sense sense on consuming and utilizing goods and products. Why would we buy a 50” TV if a 32” TV is too large to our room? Why keep TV or lights on when no one is using? We can also adopt sustainable energy sources (wind, solar, etc. ), respecting environmental constraints. Hydroelectric plants have been identified as major carbon sources, usually because their dams flood large wood areas that, when submerged, ferment and emit CO2 and methane. One study showed that some hydroelectric power plants emit more carbon than an equivalent thermal power plant. So it is not just about adopting renewable energy, but doing so while respecting the environment. It is hart to quantify how actions impact preserving the Earth and its delicate life support system. My intuition tells me that some right actions and well planned may be sufficient to reverse the situation, since we abandon demagogic positions, adopting serious and responsible measures. Recently, I herd about a campaign to save energy by turning of one computer monitor pixel. According to the campaign proposer, if 1 million people adhere to the campaign, installing a software on their computers that randomly erase a pixel of the computer screen , a certain amount of energy ( a few thousand watts / hour) would be saved . Surely this campaign did not consider two things: The first is that the software that would be installed would occupy memory space and processing time and probably spend more energy than that obtained with the deletion of the pixel. The second is that modern display is liquid crystal with fixed illumination, independent of pixels is on or off. Therefore, turning off a single pixel would make no difference. Reducing in the monitor’s brightness setting would result in affect effect thousands times greater. Make no mistake. There is not small actions that will save the planet, but large ones, as spending less time in the shower, using solar heating, avoiding to use drinkable water to unnecessarily wash sidewalks and the cars or water the grass, changing house windows for larger ones in order to more effectively use daylight, using only energy-saving bulbs, avoiding buying unnecessary products, using fuel alcohol even when gasoline is cheaper, and turning off your computer when it is not in use. It is imperative that people, companies, and governments change the way they think and do things to save Gaia, our living planet. Those who have followed this path have nothing to complain about.